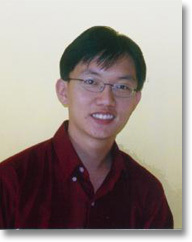 Chee-Lay Tan has published widely in both Chinese and English. His books of poems include: Chi Chu Cheng Xing [Walking Alone], 1997; Chen Zhi Rui Shi Xuan [Tan Chee Lay’s Poetry Collection], 1999; and Zao Jian Di [Where Swords are Forged], 2002. His prose publications include: Si Shu [The Four Books], 1999, co-authored with J.F. Pan, D.C. Zhou and Y.B. Ke; Ge An Guan Wo [Gazing At Myself from the Opposite Shore], critical works and essays, 2000; Lao Shi de Zuo Ye Ben [Sir’s Homework], prose and short stories, 2004; and Huang Se de Yu Yi [The Yellow Raincoat], 2006. His latest book is Chu Ren Yi Liao, Ru Wen Yi Zhong [The Unexpectedness of Literature], Global Publishing, Singapore, 2009. Born in Singapore in 1973, Chee-Lay Tan has also lived in Taiwan and the UK, where he completed his doctorate in the Department of East Asian Studies, Cambridge University (St. John’s College), specialising in Chinese poetry with particular focus on poets of exile. He was awarded the coveted Young Artist Award by the Singapore National Arts Council in 2004 and the Singapore Youth Award (Culture and the Arts), the highest accolade for youth, in 2006. He is currently Assistant Professor in Chinese at Nanyang Technological University (NTU), Singapore, and Deputy Executive Director of the Singapore Centre for Chinese Language, NTU (www.sccl.sg).